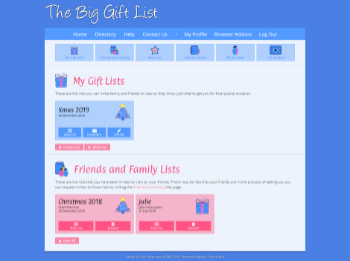 The Big Gift List - How Does It Work? This short guide will explain the process for creating a new list and inviting your friends to view it. You can also view a step-by-step guide if you have received an invite and would like a guided process for selecting items to buy from the list. Once you have registered and logged in you will be presented with your profile page. From here you can quickly access your active lists and any lists that you've been invited to. 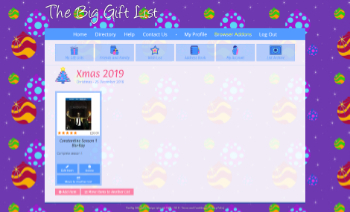 At the top of the page you will find the quick menu that will allow you to access all the main features of The Big Gift List; My Lists, Friends and Family (including those lists you haven't been invited to yet), Wish list, Address Book (for sending invites), My Account (update your contact details) and the Archive (where you can save finished lists). 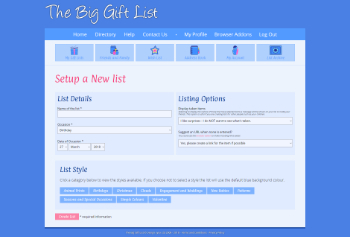 Click 'Create List' in the 'My Gift Lists' section to continue. You will now see a short form for creating the list. You can enter a title for the list, select the occasion (wedding, birthday, etc), choose one of dozens of styles for the list, select the date of the occasion, and choose whether or not you want to see what items are taken before the list ends (people invited to the list are notified that you will be able to see which item(s) they have selected prematurely). Simply following the on screen instructions to complete your first list. Once the list has been created you will be taken directly to the new lists page. Obviously as this is a new list there are no items on it and a message will be displayed guiding you to add your first item. So, lets add an item, click the 'Add Item' button (you could also use the Addon for FireFox, Chrome or Opera). You will see another form broken down into different sections allowing you to enter information about the item. Firstly you will need to enter the basic information about the item you are adding. 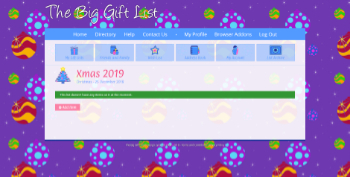 If you have found the item for sale on another website you can enter the web address for it in the form, by doing this The Big Gift List will attempt to locate a suitable image to use automatically (alternatively you can manual specify an image, consult the instructions on the page). You can also select how important the item is to you, which will indicate to other people the items you most want. If it's an expensive item you could select to make it a contribution item whereby your friends will be able to make pledges towards the total value of the item. They will be offered to print a voucher that they can place in a card along with the money they have pledged. Once you have set up the basic information click 'Next' to see the image options for the item. 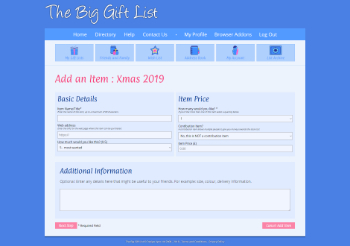 By default The Big Gift List will attempt to fetch an image automatically based on the title of the item you're adding and also from the web address you supplied for purchasing the item. If the image we found isn't suitable you have 3 other options available; Choose Alternative Image - allows you to see a selection of other images that might be better, Manually Enter Image URL - here you can type in the full web address for the image, No Image - if all else fails you can choose not to supply an image. Once you're happy with everything click the Add item button to finish. We can now see our first item listed on the page. If you need to you can make further changes to the item by clicking 'Edit Item', you can also delete the item by clicking 'Delete Item', or even move it to another list (multiple items can be moved quickly to another list by clicking the 'Move Items to Another List' button next to the 'Add Item' button at the bottom of the list). Lets now invite some friends to view the list. Click 'Send Invites' at the bottom of your list. Normally this page will display a list of all the people in your address book with those that have already been sent an invite for this list displayed in green. If the display is empty you should click the 'Address Book' button at the top of the page to add in the names and addresses of your friends. Sending invites couldn't be easier, simply click the 'Send Invite' button for each person in the address book listing that you would like to invite to the list (you can always come back an send more invites later), their box will turn green to indicate the invite has been sent. If you would like to customise the email message that is sent you can do so by clicking the 'Modify Custom Message' button. You can also uninvite friends to a list and resend an invite if you need to. Important: When you are setting up your address book you need to make sure the email address you supply for the friend is the same one they use when they sign up otherwise they will not be linked to your list. 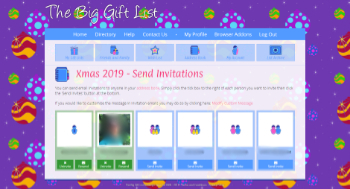 Once the invite(s) have been sent your friends will receive an email containing your invite along with registration and log-in instructions should they require them. They will now be able to see your list and select items they would like to buy you. Remember, you cannot see what items have been selected by your friends until the day AFTER the list finishes (unless you've selected to see taken items early). You can now send additional invites, or return to the list to continue adding items, or even request invites to view your friends lists.